Coco Palm Dhuni Kohlu offers you a choice of several villa types: The Beach and Sunset Beach Villas are all spacious, airy and are built with natural materials; enabling them to capture both the bright sunlight and cool ocean breezes. In addition to a bedroom, en-suite bathroom and private dining facilities, each villa has a private terrace for sunbathing and a lush garden. 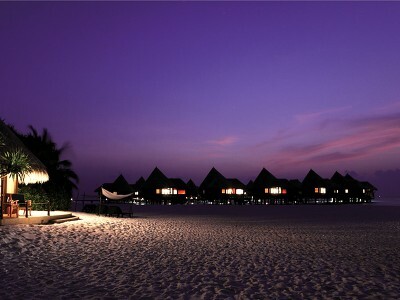 Sunset Beach Villas are located to ensure a prime view of the gorgeous sunsets, for which the Maldives is famous. Deluxe Villas, in addition, offer four-poster beds, spacious sunken baths in the open-air bathroom and a private plunge pool on the terrace. Each also offers a private pathway to the beach. The very special Lagoon Villas are built on stilts over the water, each with a plunge pool and shaded terrace. Inside, the bedrooms have four-poster beds as well as air-conditioning and fans to ensure a constant cool breeze. The bathrooms have been designed to offer impressive sea views while you enjoy a relaxing bath. Coco Palm plays host to a wealth of beautiful Beach Villas. Think: ‘lost in Paradise and loving it' aura, set amid luxuriant vegetation and romantically secluded for privacy and tranquility. The villas feature a king size bed, open air shower with fresh hot and cold water, air conditioning, overhead fan, safe, mini bar, tea and coffee maker, hair dryer, IDD telephone and private terrace with outdoor seating. With the waves lapping at the doorstep, the Sunset Beach Villas offer simple, rustic beauty with a deeply luxurious undertone. With a traditional thatched roof and open air garden bathroom reflecting authentic Maldivian touches, each villa has a private terrace with outdoor seating, perfect for lounging about and simply admiring nature as you relax. Take a walk along your isolated pathway, canopied with lush vegetation, and prepare to be mesmerised as you step out to the beach to watch the orange hues of a classical Maldivian sunset. Nestled amidst the tropical vegetation, the exclusive Deluxe Villas are situated on the beautiful Eastern shore. The villas feature a four poster king size bed, open air private garden, bathroom with sunken bath in garden, shower, fresh hot and cold water, mini bar, tea/coffee maker, personal safe, hair dryer and laundry service, IDD telephone, air-conditioning and overhead fan, private terrace with sunken fresh water splash pool and outdoor seating. There are just 12 of the magnificent Lagoon Villas, each perched above the azure ocean with stunning panoramic views. Each villa has a four poster king sized bed, large sun deck, sunken fresh water splash pool and a Jacuzzi bathroom overlooking the sea. Coco Palm Dhuni Kohlu, in the beautiful, sun-kissed Maldives, has 98 luxury villas for you to choose from. Boasting stunning scenery, this resort focuses on natural, sustainable tourism and takes great pride in looking after the lush, jungle-like flora and winding sand paths which make up the surroundings. This breathtaking island has exclusively partnered with the Olive Ridley Project to create a Sea Turtle rescue centre- a must-visit for those with a love for wildlife conservation! The choice of watersports includes water-skiing, windsurfing and the hotel has its own diving school of the highest international standard giving divers of all levels the chance to explore the beautiful coral reefs that surround the island. The local waters are home to manta rays all year round and from June- November there's a chance to spot the magestic whale shark. Every Wednesday there's a 'manta day', where the resort's resident marine biologist leads a group of guests out into the Baa Atol to search for these fascinating gentle giants. For the ones who prefer staying dry, Coco Palm also boasts a fully-equipped gym and tennis, badminton and volleyball facilities. Craving a day of pure, simple, luxurious relaxation? Choose one of the many treatments at the acclaimed Coco Spa where the ingredients and techniques are sourced from across India, Thailand and Indonesia. Alternatively you can soak in the warm sun on the golden sands, or enjoy a book on your private terrace. You have two restaurants to choose from at Coco Palm Dhuni Kohlu: the Cowrie Restaurant features a range of world cuisines that are freshly prepared in front of you and the Cornus Restaurant specialises in dishes from the Maldives, Thailand and India. Drinks and snacks are available throughout the day at the Conch and Beach Bars. For those seeking something a little more intimate, private dining in your villa can be arranged. Shared Sea Plane transfer for US$442 per person round trip (operating hours: 06:30-15:00). Travel time: 30-35 minutes, covering 124km. Domestic flight and shared speed boat transfers for US$336 per person round trip (operating hours: 06:30-20:30). Travel time: 30 mins flight + 40-45 minutes speed boat. Transfers must be booked in advance of arrival. The closest airport to Coco Palm Dhuni Kolhu is Dharavandhoo Airport, 40-45 minutes away by shared speed boat. If a cancellation is made within 7 days of the arrival date, 100% of the total stay will be charged. Rates at Coco Palm Duhni Kohlu do not include taxes or service charge. This can not be guaranteed but we will try to fulfill your requests. Yes send me the next "hot" destinations, offers, and insider info on unique small independent boutique hotels from around the world. The Beach and Sunset Beach Villas are all spacious, airy and are built with natural materials; enabling them to capture both the bright sunlight and cool ocean breezes. In addition to a bedroom, en-suite bathroom and private dining facilities, each villa has a private terrace for sunbathing and a lush garden. Sunset Beach Villas are located to ensure a prime view of the gorgeous sunsets, for which the Maldives is famous. Deluxe Villas, in addition, offer four-poster beds, spacious sunken baths in the open-air bathroom and a private plunge pool on the terrace. Each also offers a private pathway to the beach. 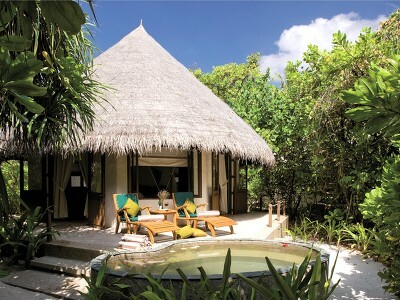 The very special Lagoon Villas are built on stilts over the water, each with a plunge pool and shaded terrace. 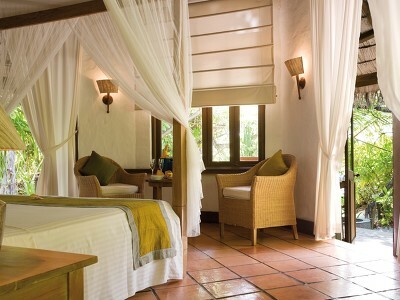 Inside, the bedrooms have four-poster beds as well as air-conditioning and fans to ensure a constant cool breeze. The bathrooms have been designed to offer impressive sea views while you enjoy a relaxing bath. Amazing island good hotel but shouldn't be a 5 stars. Great place for vacation. Silent & great for honeymoon. It has delicious meals with great variety. Only lacks social activities which would be boring especially for kids. Fantastic place, make sure to book a lagoon for a full experience. The rooms are a bit old but nicely furnished and equipped. Food in the main buffet restaurant is excellent with high quality. Staff is friendly and very helpful. Make sure to go snorkeling, I recommend globing around the sand bags for a garden of fish, you can spot those easily if you walk besides the lagoon area. I recommend booking on half board basis. The bar’s food isn’t expensive for a lunch and has a nice setup for a change from the dinner buffet. 3 nights are sufficient for a stay here.